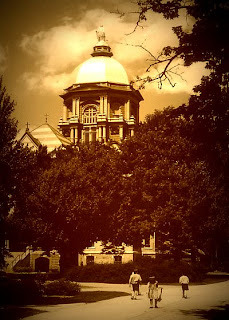 Fighting Irish Thomas: Notre Dame, Abortion, and Obama: Our Lady's Civil War? Notre Dame, Abortion, and Obama: Our Lady's Civil War? "By the time we got to Woodstock, we were half a million strong ..."
"Anyone who has read the works of Fr. McBrien, and several other professors, knows that there is a threat to (Notre Dame's) Catholicism from within as well. But unlike Harvard or Yale, Northwestern or Southern Cal, all former Christian universities that are now secular schools, Notre Dame has the weapon to fight all heresies, namely Notre Dame Herself ... for the modern infidels to take control here, they would have to blow the Dame off the Dome, rip the heart (the Eucharist) out of Sacred Heart (Church) and lastly, rock by rock, tear the Grotto apart. And legions of Her sons and daughters would willingly die martyrs before they would allow that to happen." Tom I would like to refer everyone to TFP.org Time to spread Our Lady's message. Evil abounds and enters the Church as Predicted at Fatima. My daughter had/has a on-going vision too. Three years of White House Dreams! Every Night ! Some of it has already come to fruition...some of the dreams/vision. They are primarily good dreams. Yes, I too believe Gov. Mike Huckabee will convert to Catholicism ! I also Know that these are the times of the new prophets and visionaries and the gifts of the Spirit in the Faithful. Be Watchful. I agree... Mary's Message at Fatima must be propagated now ! Devotion to the Holy Eucharist and Our Lady must return for restoration & renewal of Christ's Church on Earth. Jesus, Mary, We Love You, Save Souls ! A Phenomenal Site by the way. Thanks for writing. I'm sure that, after a hard day out fighting the culture wars, yours is a site for sore orthodox eyes too. You are so right. We need to fervently PRAY to Our Lady! Tom, On Thursday, 3/19 Ivan from Medjugorje was in South Bend and received his message from Mary. It was a beautiful spiritual event. The next evening the news broke about ND and the Obama choice. Living here I am not surprised. ND is not about Catholism but the almighty dollar and prestige. Donors and generous alumni must speak out by not giving money. The priests do not run ND---only the board does. Anon -- Saturday, March 21, 2009 6:22:00 PM -- As the Church hasn't ruled officially on Medjugorje, I do not want to weigh in positively or negatively (where exactly in South Bend did Ivan speak?) on that. Still, as there have been corrupt popes in the past, we are now going through a period of morally dubious university presidents (not to mention our U.S. president! ), but I still believe Our Lady will pull Notre Dame through this, just as she once spiritually turned around Rome. How prophetic you were about Obama being extended an invitation by ND. What now for us devoted, truly Catholic alumni?